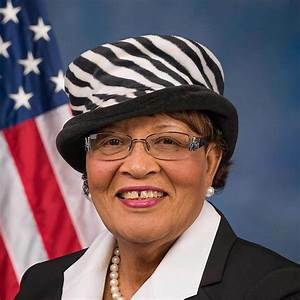 Congresswoman Alma Adams (D-NC-12), who represents the Charlotte-Mecklenburg area in her congressional district, was among several public officials last week outraged by former Gov. Pat McCrory’s remarks, chiding the election of so many black-elected officials to government leadership there. “I’m worried about the segregated aspects of Charlotte-Mecklenburg politics, and lack of diversity we might have,” the Republican former governor, who many recall enthusiastically signed the 2013 law restricting early voting and instituting voter ID before it was eventually struck down, told his listeners the morning after the May 8thprimary. 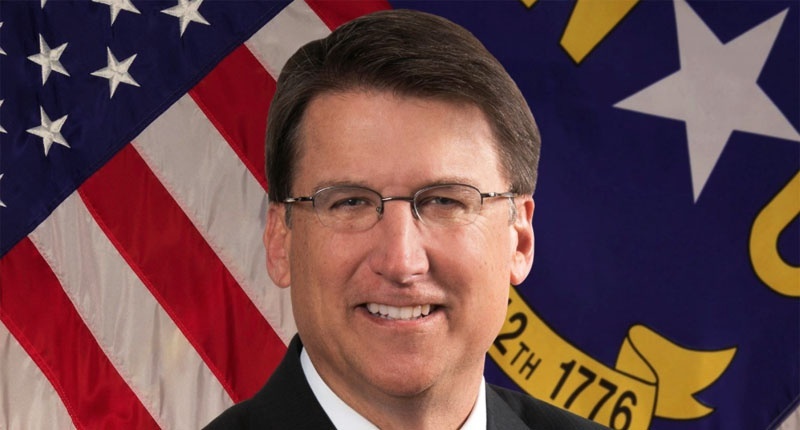 McCrory has since claimed that he was acting as a “political analyst,” and not a partisan when he expressed dismay last week on his daily WBT-AM radio show about the successful influence of the Charlotte-Mecklenburg Black Political Caucus, and the fact that so many of the candidates it endorsed won their primaries, including candidates for sheriff and district attorney. “We see now that the Black Political Caucus is the major influencer in who wins the Democratic primary,” McCrory warned. McCrory, who served as Charlotte’s mayor for 12 years before he was elected governor, also openly lamented that the Queen City’s current black mayor, Vy Lyles, said nothing in support of the white Democratic incumbents, like the sheriff, during the primary. “McCrory’s comments are appalling but not very surprising,” Rep. Adams said in a statement. “I wonder if the former Governor will speak up about the gerrymandering that has led to a majority Republican North Carolina General Assembly and Congressional delegation?” she asked rhetorically. Irving Joyner, law professor at North Carolina Central University in Durham, and one of the lead attorneys who battled McCrory’s voter ID law, slammed the Republican, saying that his “feigned alarmed” was very similar to white warnings of black political progress after the Wilmington election of 1898, which resulted, then, in bloodshed against blacks. “[His words are…] seemingly designed to arouse the attention, emotion and opposition of his extreme conservative base around the State,” Joyner said in a statement. Was the violent videotaped May 4tharrest of 22-year-old Anthony Wall of Fayetteville by a Warsaw police officer outside of a Warsaw Waffle House, and its aftermath, a case of excessive police force? Attorney Benjamin Crump, well-known nationally for his advocacy of alleged police abuse victims, says yes, and appeared with Wall, and Fayetteville attorney Allen Rogers, Monday during a press conference in front of the Cumberland County Courthouse. Crump says he wants to see police dash-cam video, as well as video from inside the Waffle House restaurant, to determine all of what was said and done, leading up to and including the now infamous smart-phone video that purportedly shows Warsaw Police Officer Frank Moss with his hand tightly around Wall’s throat, slamming the young man against the Waffle House store window outside, and then body slamming the young man to the parking lot pavement. The video has spurred cries from no less than The NAACP Legal Defense Fund, and even the daughter of late civil rights leader Rev. Dr. Martin Luther King, Jr., Rev. Bernice King, CEO of The King Center in Atlanta, who tweeted upon reading a story about the incident, "Family, let's stay out of Waffle House until thecorporate office legitimately and seriously commits to 1. discussion on racism, 2. employee training and 3. other plans to change; and until they start to implement changes." Rev. 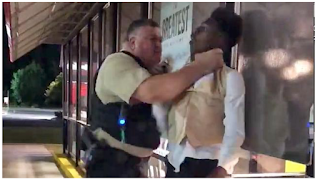 King was referring to not just the May4th Warsaw incident, but an earlier controversy at a Waffle House in Alabama where white police officers arrested a young black woman, wrestling her to the ground, and according to video of the event, exposing her breasts while handcuffing, with one officer threatening to “break her arm” if she did not comply. The video of what happened to Wall outside of Waffle House May 4thhas raised questions as to whether Officer Moss could have employed a far less lethal manner to subdue Wall after an allegedly boisterous confrontation between the Fayetteville man had with Waffle House staff inside the restaurant. Wall had escorted his 16-year-old niece to her prom, and had taken her to the restaurant afterwards to eat. However, apparently because of a busy night, all of the tables had not been cleaned for them to be seated, reportedly. A video posted to the Duplin TimesFacebook page from inside the Waffle House shows a young black man closely resembling Anthony Wall, along with a young black female, both formally dressed, standing at a table, yelling and cussing at Waffle House personnel. There are other African-American teenagers in the video that also apparently attended a prom. The next scene in the video shows a different angle of the Officer Moss arrest of Wall. He already has the young man down on the ground, and another officer in a dark uniform is assisting in handcuffing wall before he is taken away. Atty Crump indicated that a lawsuit is most likely in the offing against the Warsaw Police Dept., and most likely Waffle House, as well. 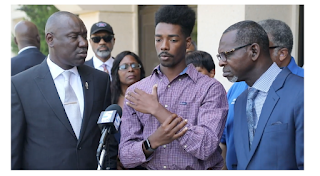 He alleged that his client was the target of gay slurs from at least one Waffle House employee, thus causing the confrontation before Offer Moss arrived. The open question now is, once Moss did arrive after he was called by the Waffle House staff, how did he try to defuse the volatile situation, and did he consider the admittedly angry Wall such a threat, that the officer was justified in using near lethal force? The mayor added that the State Bureau of Investigation in probing the matter. So is the Warsaw Police Dept. But atty Crump and others disagree, asking if Anthony Wall were white, would he of been treated in the same fashion? In 39 state capitols Monday – from Raleigh, NC to Sacramento, California - protestors holding signs saying, “ Systematic Racism is Immoral, and “Fight Poverty, Not the Poor,” vowed to steer the nation and public policy back towards caring about the least of us. Then, to emphasize the point, protestors committed deliberate “direct acts” of civil disobedience, and promised more of the same over the upcoming six-week period, to put the spotlight on issues such as racial and economic injustice, militarism, and the need for affordable health care. The North Carolina “Poor People’s Campaign: A National Call for Moral Revival,” launched May 14thwith approximately 250 demonstrators gathered in Bicentennial Mall across from the NC Legislative Building in downtown Raleigh, in over 90 degree heat, demanding sweeping changes in policies addressing poverty, and education. According to organizers, “53 people were cited for impeding the flow of traffic in front of the North Carolina General Assembly” on Jones Street (The Raleigh Police Dept. confirmed 49 people were issued citations for the same misdemeanor offense). In Washington, D.C., former NCNAACP Pres. Rev. Dr. William Barber, and Rev. Liz Theoharis, the co-chairs of the Poor People’s Campaign, were arrested along with hundreds of other demonstrators from across the United States. In each participating state, the memory of Dr. Martin Luther King, Jr.’s 1968 unfinished Poor People’s Campaign was invoked, along with a vow to this time, see it to the end. Those who spoke Monday at the Poor People’s Campaign rally in Raleigh’s Bicentennial Plaza called for an end to repressive public policies coming from the Republican-led NC General Assembly, and the Trump Administration in Washington, D.C.. When the time for direct action came, designated protestors locked arms, and left the Bicentennial Plaza, walking to Jones Street in front of the Legislative Building. 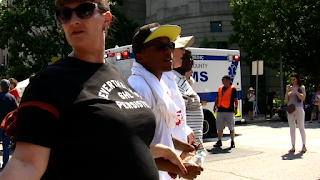 There, under the watchful eye of State Capitol, and later Raleigh Police, participants – black, white, young, old, and even handicapped - formed a large circle in the street, and with the exception of moving to a shaded area under a tree, stayed in the street with their arms locked, singing and chanting. As Raleigh Police officers asked each one to move out of the street, and they refused, they were taken, without force or handcuffs, out of the line, and walked beyond the police lines to waiting patrol cars, where they were given written citations. North Carolina organizers promise to repeat again next Monday, May 21st, when the Poor People’s Campaign addresses racism and immigration. [RALEIGH] A Wake County grand jury this week indicted a Wake Sheriff’s deputy, and two MNC State troopers for the April 3rdbeating a a 29-year-old black man, apparently for no reason. Kyron Dwain Hinton says he’s pleased that the law enforcement officers – Deputy Cameron Broadwell, and troopers Michael Blake and Tabitha Davis – were indicted with assault with a deadly weapon inflicting serious injury, and willfully failing to discharge duties. Hinton says he was assaulted and arrested while walking home from a sweepstakes parlor late April 3rd. The arrest warrant alleged that he was pointing his hand in the air as if he’d had a gun, and ignored commands to get on the ground. The warrant also alleged that he physically resisted being handcuffed, and the deputy’s K-9 unit dog had to be used to restrain him. But Hinton counters that he did nothing wrong, was unarmed, and was beaten up against a patrol car with their flashlights, and the dog was allowed to attack him and bite him on the arm. Hinton sustained injuries to his face, head and torso, along with a broken eye socket. All charges against him were dismissed by the Wake District Attorney’s Office. A local television station is seeking footage from the body cameras worn by gthe officers that night.